1 thing you may not know about me..
and what i love more than baking.. decorating what i baked! 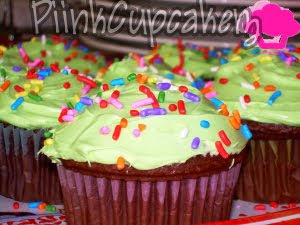 I love cupcakes they are so good i might give you one for your birthday ool..... liking the blog really..
Yum! That would be awesome! Great idea! Can't wait to see them! I really need some cupcakes right ! I freakin' LOOOOVE cupcakes. I don't really do regular cakes, but cupcakes? Yummmy, I'm all over it. I can't bake from scratch either, lol. But hey, as long as you put in all that love when you're baking...it tastes delish no matter what! Looks so pretty and yummy! Your so great at this! they look so cute and yummy!!! Yes,that sounds like a great idea!! I love this idea! I'm a cupcake-holic. Seriously, I'd rather my husband surprise me with cupcakes than jewelry any day! I'll eat six in one sitting! Yeah, share your creations with us, fa sho!